It feels good to be back in California. I’ve spent time recently in Texas, and before that I was in Toronto and Philly. I won’t be leaving the West Coast for a few months and I couldn’t be more thrilled about it. I like it here. Despite my love of charts, I force myself to leave the computer screen a lot. When you do, you quickly learn, or are reminded of, the value in getting away and then coming back to re-evaluate everything you previously thought before you left. There’s a lot of data waiting for you once you’re back at the desk. Is there enough data to change your mind or does it just confirm what you felt previously? I spent last weekend, both Saturday and Sunday, looking through charts and enjoying the start of the college and pro football seasons. Back when I lived in New York, this was my favorite time of the year. The weather is the best in September and October and everyone is back from their weekends in the Hamptons, Jersey Shore, Cape Cod or various other Northeast vacation spots. The city gets going again, and so do the markets. The past couple of weeks are what I like to refer to as the Seventh-Inning Stretch of the market’s calendar year. Now that the adults are back in the room, we can see if is risk appetite for stocks, or if they come back to the office selling. The way I see it, most of the institutions are not happy with their performance this year. A lot of what I’m hearing from my hedge fund and RIA clients is that diversification has cost them greatly in 2018. Unless you’ve been 100% invested in U.S. stocks, you’re not beating your traditional benchmarks. Going with any sort of emerging market or European exposure has been turned out to be a poor decision. It’s such an interesting phenomenon that what’s considered to be “common sense diversification” among many portfolio allocation strategies has cost investors dearly this year. I came back from Texas open-minded, knowing that major indexes were flirting with their former highs in January and a potential failure here could set up all sorts of bearish momentum and breadth divergences. The bears keep reminding me of this on Twitter. I’m still open to the possibility of a complete collapse in the U.S. equities market. But based on the weight of the evidence, it seems clear that there are just a lot more stocks I want to buy than stocks I want to sell. Breakout Profits subscribers know what I mean, getting one trade a week with clear risk-management details. When could take stocks to another level? Rates breaking out could be one. If the U.S. 10-year yield were to convincingly break out above 3% and rip towards 4%, we could see a lot of money rotating out of bonds and looking for a home. Unless the 10-years are above 3%, I don’t think there is any reason to blindly be shorting U.S. Treasury bonds, but I do think there’s a big opportunity coming. I encourage everyone to get away from their screens and come back after some time to re-evaluate. The daily distractions from the poisonous media outlets can get overwhelming. It really is a cancer to your portfolio and only gets worse as it builds up over time. It’s funny, at the hotel in Houston where I stayed, the business center TVs showed the financial channels. I immediately felt my anxiety levels rising as they made it seem like if I was not paying attention to their talking, that I was somehow missing out on important information. Some dude with a British accent was explaining to me how stocks had massive selloffs throughout the day. Meanwhile, the Dow was flat. It was clear that my body was rejecting the noise coming from this plasma on the wall. I’ve found it helpful to listen to your body. As a former athlete — I played college baseball — we were always taught to pay attention to pains and recovery times in specific muscles. The rest of my trip was amazing. I shared some of it here last Friday. 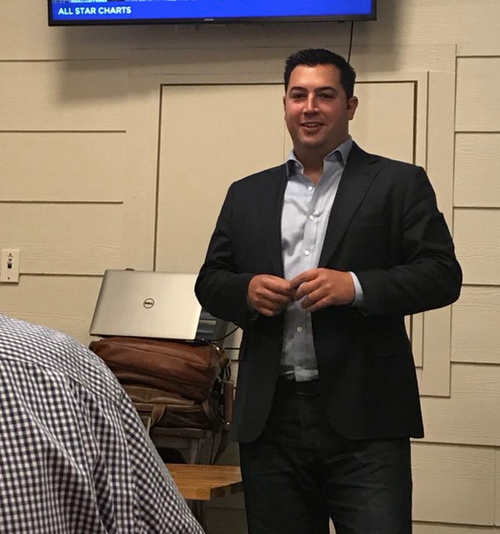 I had some killer BBQ and gave presentations in Dallas, Austin, and Houston. I also got to hang out with another “chart artist,” Mike Hurley. Mike does amazing work and is one of the smartest technicians in the business. He brought out a cocktail napkin, still wet from my bourbon on the rocks, and started drawing charts. This is such a classic move that I just loved being a part of. Mike made a great point that this was 1953 all over again. That year came within an ongoing secular bull market and the S&P 500 corrected 14% to 15%. The S&P 500 doubled from there. So did the Dow Jones Industrial Average. I keep hearing from the people on “the Twitter” that the stock market is going to collapse and this is 1987 or 1929 all over again. Those analog charts have proven to be completely useless, and have even done a lot of harm to the poor people who took action because of them. They make great headlines, but they’re not for us. I think the 1953 angle makes a lot of sense considering where sentiment is today. If you divide the current market sentiment into four buckets: Very Bearish, Kind of Bearish, Kind of Bullish, and Very Bullish, I would argue that the last one, Very Bullish, would be the most empty of the bunch. 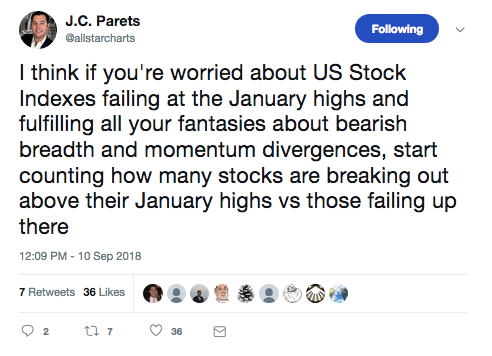 But I’m still in the camp that we’re in the early stages of a new bull market, and nowhere near the end of the cycle.